As the chances of Larry Summers being named Obama’s next chairman of the Federal Reserve increase, the media needs to question his previous statements—and women need to mobilize against the man who once said that men are smarter than they are. I ticked off some of the self-serving lies he told to cover up his own role in destabilizing the financial system when he was Treasury secretary in the Clinton administration—when he personally blocked tougher regulation on the financial time bombs known as derivatives, when he collaborated with Republicans and the Federal Reserve in dismantling Glass-Steagall and other New Deal protections. Larry and Bill, Robert Rubin and Alan Greenspan paved the road to financial collapse. Afterwards, nobody went to jail. These scandalous matters are relevant once again because the White House propagandists are pushing hard to make Larry Summers the next Federal Reserve chairman. If Obama makes that choice, Wall Street wins again. Summers is their candidate and at home in their money culture. As Fed chair, he would become their main watchdog . If so, this will be a sick joke on us hopeful voters who re-elected the president last fall. Summers worked on Wall Street after he got bounced as Harvard president and before he joined the Obama administration in 2009. During the year before, he earned $5.2 million at a leading hedge fund, D.E. Shaw. Then he made another $2.8 million for speeches, more than forty of them, mostly delivered to audiences at mega-banks and leading financial firms. These included JP Morgan Chase, Citigroup, Merrill Lynch and others. Goldman Sachs paid him $135,000 for one speech. When Summers learned Merrill Lynch was receiving federal bailout money, he gracefully contributed his $45,000 speaking fee to charity. The point is, this watchdog will know some of the swindlers personally. These sticking points about his nomination for the Fed chair may be obvious to Nation readers, but none of his liabilities or gross errors or giant fibs were mentioned by Washington Post blogger Ezra Klein when announced on Tuesday that Summers is now the leading candidate for the Fed appointment. That news quickly swept the web as though it were a done deal. Let’s hope that is wrong. Klein is a conscientious policy wonk and often insightful about economic policy but on political questions he can sound like an establishment camp follower. Klein took the feed from his White House sources and obediently recited the supposed virtues they see in Summers compared point by point with the rival contender, Fed vice chair Janet Yellen. “Rightly or wrongly,” Klein wrote, “there’s a sense that Summers has the market’s trust in a way Yellen doesn’t.” That put-down is a nasty bit of knife work sure to please Klein’s sources, but is truly slanderous if you know Yellen’s biography and intellectual stature. If the White House blather and media ignorance prevail, it will be sad for the country and shameful for Obama. 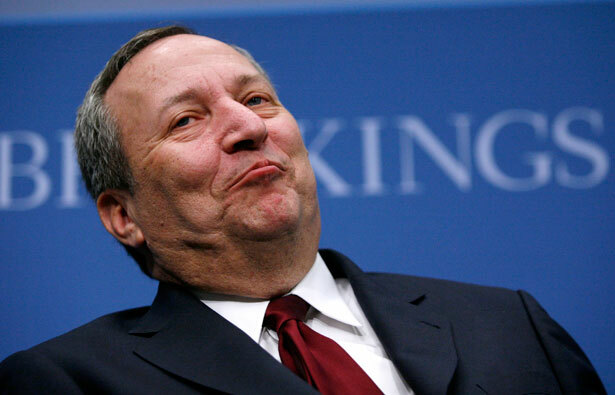 Does the Clinton-Rubin establishment believe, like Larry Summers, that boys really are smarter than girls? Reporters like Klein should ask, because that’s the way it looks. Women at large should mobilize an aggressive pushback—no more second chances for Larry Summers. The Obama administration should impose a glass ceiling on the old boys who got it wrong.